As the little child lay her head on the pillow, she eagerly awaited the dream. Through the mists of time he came…racing the wind…his silky mane and tail flowing gaily in a salute to his creator… a head so chiseled it seemed of the finest delicate porcelain…his coat the color of the black desert night from which he came. Generation after generation, little children and adults have seen him in their dreams. The black Arabian has always been the stuff dreams are made of. No other breed or color has generated so much interest in literature and art. The Arabian Horse Registry of America has given us four basic colors to choose from in registering our horses, an over-simplification, but one that creates much less confusion. (The study of genetics can be complicated to say the least.) All the factors identifying colors are still not known and the experts revise their thinking daily so we are getting closer to a better understanding. Terminology in different areas can also create conflict. Horses of other breeds as well as our own partbreds use a variety of different names to describe the different shades of our four basic colors: brown or bay, sorrel or chestnut, palomino or flaxen, just to name a few. Even the experts can’t seem to agree on various symbols in gene relationships. Is black E or is it B? Basic coat color in horses is due to the presence of two types of pigment in the hair: eumelanin, causing the black and in some cases a dark chocolate brown, and phenomelanin, causing red, tan, or yellow. The phenotype refers to what you see on the outside of the horse while the genotype refers to what is hidden. White is not a color, but actually a non-color and lacks pigment. The primary hard colors in horses are black, or brown, and chestnut. (Grey is considered a member of the white hair pattern group.) Bays are the most common and considered to be the most dominant. These are horses with black points (mane, tail, legs, and ear tips). The Arabian breed contains a certain type of dark brown bay that often masks the black gene. Chestnut is the next common and is some shade of red with non-black points. The rarest color is the black (horses with the uniform black color over the entire body). The rarest of the rare is the dominant, or homozygous, black. The genetic control of these hard colors lies at two loci, the Agouti and the Extension. (The locus is the point at which the color starts.) The Agouti determines the color of horses with black points and blacks, and the Extension, the basis for chestnut. The dominant or homozygous black individual will receive a black gene from each parent and be uniformly black, and in some cases, brown. The heterozygous black individual will also be black but will carry the recessive chestnut gene that will be masked by the black gene. This heterozygous horse can produce a chestnut at any time, even if mated to another heterozygous black. If an individual is homozygous, then the dominant allele will be present at the extension locus. This allele, known as ED, will attempt to turn the horse black regardless of the base color occurring at this locus. Proof of this has been recently substantiated and internationally documented by the breeding of the black stallion, Serr Ebony Star, to numerous chestnuts of all breeds. In 41 breedings with the majority of the mares chestnut, all of the foals were black or near black. Of these breedings, three were known dominant recessive chestnuts. The chestnut genes of the palomino, red dun, and Haflinger all lost to the dominant black. In stepping out of his own breeding base of Arabian blood, a breed that has been bred along certain lines and strains for centuries, Serr Ebony Star has proven beyond any doubt the existence of dominant black occurring at the extension locus in all horses. *All biochemical action occurring in living organisms take place in genes. Genes appear on chromosomes which can be conceived as strings of genes. These chromosomes come in pairs with an individual taking one of each pair from each parent. The homozygous black can only be proven by the breeding of blacks to chestnuts. If no chestnuts are born in at least 20 black to chestnut breedings, and that horse’s sire and dam also had no chestnuts, the horse can be considered to be homozygous black. Since it is difficult to test a mare for twenty foals, stallions are usually the basis for study even though there may be plenty of homozygous mares. The homozygous black will often produce a bay but it will be a very dark bay, or nearly black, with the absence of the normal red tint associated with most bays. This horse, despite it’s bay appearance, can also be a carrier of the gene. Grey can override the color, but the gene still remains there in a hidden state. In the Arabian breed, and particularly Arabians in the U.S., the dominant gene is more predictable and follows an unbroken line. Tracing this line, however, is very difficult due to the great number of dark bays and greys the gene can hide in. who has never sired a chestnut. The United States is the leading black Arabian producing country in the world with 11,642 blacks registered to date. California is our foremost black producing state with 1,392 blacks registered. Canada is the only country that even comes near U.S. production with 1,126. In tracing many of the pedigrees of foreign blacks, it can be noted that these horses were also derived from earlier U.S. importations or have common ancestors. The very few that do not follow this pattern fall basically into the Polish or old German lines. The absence of blacks in other countries such as Spain, France, etc. is an indication that these black horses are recessive in type. WHERE DOES THE BLACK COME FROM? a stallion of Davenport breeding. Fa Serr's influence was multiplied by his sons Fa-Rousse (24 black get), Khemahr (20 black get), Ozem (29 black get), and Negem (17 black get). Of these four sons, Negem was the only one that did not sire any chestnuts out of 93 offspring. Negem, who is very often forgotten, appears to be the unsung hero here and is responsible for several unbroken lines of what can be considered to be homozygous black. Malabar Farms linebred the great-grandson of *Fadl, Sa Zarka (10 black get), to produce Malabar King-Prince Ebony (101 black get), Malabar Duke (60 black get), and Malabar Sheik (35 black get). (It should be noted here that there are two Malabar Kings; the one we are referring to here is Malabar King-Prince Ebony.) Of these three only Malabar King-Prince Ebony had no chestnuts out of 134 foals. He is the leading sire of blacks today. Sa Zarka also had no chestnut foals and created his own dynasty at Malabar Farms. In 1932, the stallion *Zarife, a grey, and the mare *Roda, also a grey, were imported by the Maynesboro Stud to produce the black stallion Hallany Mistanny who sired 16 black foals. Most of the new Egyptian blacks seem to stem from the super stallion Nazeer, a grey. The Nazeer line is a good example of the grey masking the black phenotype. In other words, the black hid out in the grey until the right combination of parents came along to cause it to express itself. On extended pedigrees leading to black there seems to be two ties between the new and the old Egyptian lines: The root mare Venus of the Hadban Enzahi strain and the stallion Dahman. Dahman is the sire of Rabdan, who appears three times in the fifth generation of Nazeer's pedigree and is the grandsire of *Fadl. 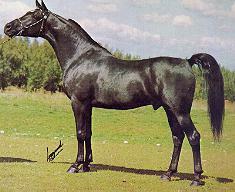 The desert bred Kuhailan Haifi is believed to be responsible for another long line of black breeding through his son Ofir. The Ofir line produced *Witez II (4 black get), *Bask (13 black get -- 3 stallions and 10 mares), *Aladdinn (44 black get), and *Fortel (9 black get). The lines of *Witez II, *Bask, and *Aladdinn also contain the blood of the black mares Czbessie II, born in 1814, and Kabron I, born in 1813. The line of Kabron is passed on through the bay stallion Tajar and crosses the Czbessie II line in Amurath. Both of these mare lines can be found in the Polish root lines of Amurath, Hamdany, Seglavi, etc. The root mares appears in the dam lines of Balalajka (dam of *Bask), Federacja (dam of *Witez II), and Lalage, (dam of *Aladdinn). These horses also became black producers. The bay stallion *Fortel seems to have acquired his black genes from an unknown desert source or the line of Ofir, which can only be traced back to the desert bred Kuhailan Haifi. The first of this line to sire black was *Witez II. 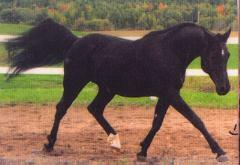 His most notable black-siring son was Nitez (6 black get), sire of the black and the black-siring Niga (12 black get). Niga, in turn, sired the two bays G-Amigo (8 black get), and Gamaar (1 black get) and the black Nizaun (17 black get). The line of *Witez II through Nizaun contains no chestnut foals. *Bask, by the Ofir son Witraz, sired Port Bask, a bay (29 black get), who in turn sired Port Ebony Bask, a black (20 black get), and Port Ebony Bask's black son Bask Knight has thrown 9 blacks. *Aladdinn, by the Ofir son Nureddin, has sired 44 black get to date. The dreams of little children the world over will be secure for all time. The black Arabian will never be obsolete as its lines strengthen and endure time's passage. Bey Shah and his offspring have also made a name for themselves in the area of black production. Bey Shah has 22 black get with his son Off Broadway throwing 13 black get to date. *Ansata Ibn Halima sired 6 black get, while *Morafic sired no black get in the first generation but has in the second and third. 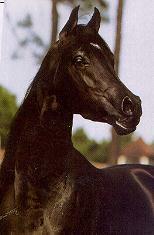 The black *Morafic grandson Bahim Hisan is the sire of 38 blacks to date. 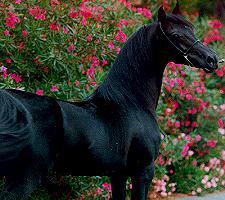 The black stallion *Adhem by Alaa el Din (by Nazeer) sired 32 blacks. 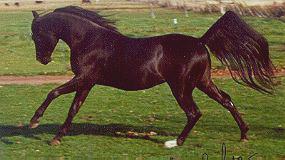 Saud el Ameer, his son, has sired 75 blacks and no chestnuts in 131 breedings. The black-bay Desperado V can be credited with siring a number of black foals, including the mare Mona Lisa V, who will be the equine star of an upcoming Mike Nichols film entitled All The Pretty Horses. The bay stallion The Minstril, also Nazeer-bred, has thrown 18 blacks to date, while his bay son Thee Desperado is the sire of ten. 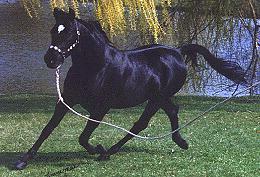 The star of The Black Stallion movies, Cass Ole, sired 27 blacks in his lifetime.